In recent years, Cone Health has experienced solid growth in patient service revenue, generating a 10.3% jump to $1.1 billion in fiscal 2013 over the previous year. The Greensboro, N.C.-based system received a boost from new operations and added patient volume through its affiliation with Alamance Regional Medical Center in Burlington, N.C., an alliance strategy being widely pursued across the country. It also negotiated higher rates with its insurers. Yet despite the revenue increase, it finished the year with an operating deficit of $44.1 million as rising salary, benefit and retirement costs contributed to an explosive 18.3% hike in expenses. Its higher volume translated into higher supply costs. And it incurred new expenses from installing an electronic health-record system, opening a new tower and integrating Alamance. Despite a buoyant stock market streak by some publicly traded chains, healthcare providers as a group continue to operate with slim and shrinking margins. 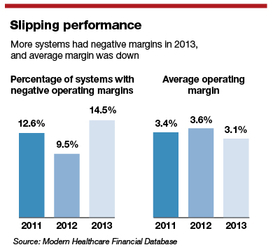 Overall, a smaller percentage of healthcare providers saw positive operating margins last year compared with the previous two years. Modern Healthcare's analysis found that the average operating margin in 2013 was 3.1%, down from 3.6% in 2012 based on data available for 179 health systems, which included acute-care, post-acute care, rehabilitation as well as specialty hospital groups and some stand-alone hospitals. A total of 61.3% of organizations in Modern Healthcare's analysis saw their operating margins deteriorate over the previous year. Healthcare executives acknowledge that the business landscape has been challenging. But some believe a turnaround could happen as soon as this year as some cost pressures ease and they begin to test the business case for bundled payments and accountable care organizations. But analysts remain skeptical that the worst is over. Volumes are down as much as 7%. All three credit-rating agencies have a negative outlook on the not-for-profit healthcare sector. Moody's Investors Service, for instance, says it has been downgrading twice as many not-for-profit providers as it has upgraded. Many of the upgrades are due to acquisitions rather than organic growth. At the same time, costs are rising as providers invest in the new technology and care-coordination staff needed to participate in healthcare reform's new payment models. At Cone Health, Akin acknowledged that a drop in utilization “outstripped our ability to cut costs.” But things are picking up. The first six months of fiscal 2014 are already ahead of budget. The system made “major improvements” in its revenue-cycle functions and instituted more flexible staffing arrangements to match swings in volume. “I think the next few years will be very, very challenging,” Akin said. Cone isn't alone. Only 84.4% of provider organizations operated in the black last year, down sharply from the 89.2% that had positive results in 2012 and even below the 86.9% of providers that posted positive results in 2011. Data were available for 222 organizations for fiscal 2012 and 206 for fiscal 2011. Major investments to get ready for new payment and delivery models still aren't generating a meaningful return. Arrick said hospital executives estimate less than 5% of revenue comes from population health management. “It's going to be really slow and there are a lot of people who basically see themselves operating in a fee-for-service environment,” he said. 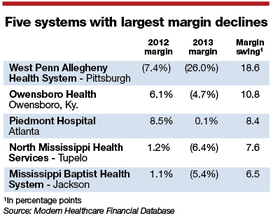 Providence was among the systems with shrinking margins last year. The falloff in its financial performance this month led to a ratings downgrade from both Moody's and S&P. To prepare for population health management, the five-state system implemented a new EHR system across all its hospitals at a cost of $750 million. It has also invested heavily over the past three years to build a shared-services division—a centralized unit that handles back-office functions such as revenue-cycle management and accounts payable. As revenue from patient care declines, hospitals are increasingly making up the shortfall with non-operating revenue, said Paula Song, an associate professor of health policy and management at the University of North Carolina's Gillings School of Global Public Health. However, the systems that are most likely to be struggling financially are also the ones with the smallest cash cushions and therefore less cash to invest. They missed out on the opportunities in last year's bull market, Song said. United Surgical Partners International, which operates ambulatory surgical centers as well as hospitals. HealthSouth Corp., which operates 103 rehabilitation hospitals in 28 states, according to Securities and Exchange Commission filings. Cook Children's Health Care System, a two-hospital system based in Fort Worth, Texas. Some acute-care hospitals are bucking the trend, however. NorthBay Healthcare in Fairfield, Calif., which operates 157-bed NorthBay Medical Center, has improved its operating margin from negative 2.1% in 2011 to 0.2% in 2012 and 6.3% last year. Its secret? Four years earlier, NorthBay, which is about halfway between San Francisco and Sacramento, began focusing on keeping its patients in Solano County for specialty services such as cardiovascular surgery. It also has received designation as a Level 3 trauma center and is seeking a Level 2 designation. NorthBay doesn't need a larger partner to survive, CEO Gary Passama said.